An unfriendly rainfall forecast from the Bureau of Meteorology (BOM) for August has seen a lift in cattle numbers at the sale yard. Most notably, NSW and Queensland have seen cattle prices hit the skids again this week. The BOM are forecasting incredibly low chances of the rainfall over August getting above average seasonal levels, particularly across NSW (Figure 1). Indeed, nearly all the country faces an abnormally dry finish to the winter and the extended three-month forecast window to October doesn’t provide much relief either. There are pastoral zones that rely heavily on late winter/early spring rains to set up their pasture levels to carry them over summer and it looks like this year the rain is going to fail them. This appears to have prompted a run of cattle brought to the sale yard this week across the East coast. Throughput numbers surged above the upper end of the normal seasonal range that could be expected for this time of the year (Figure 2). In Queensland, weekly cattle throughput is running 56% above the five-year average and in NSW cattle yardings are 28% above the normal levels. This has combined to put total East coast throughput levels above 61,000 head on the week to sit nearly 30% above the seasonal average. The impact of the higher sale yard numbers is putting pressure on prices for most categories of cattle this week (Table 1). The Eastern Young Cattle Indicator (EYCI) was off 4.3% to close at 477.25¢/kg, which is mirroring most other categories of cattle. 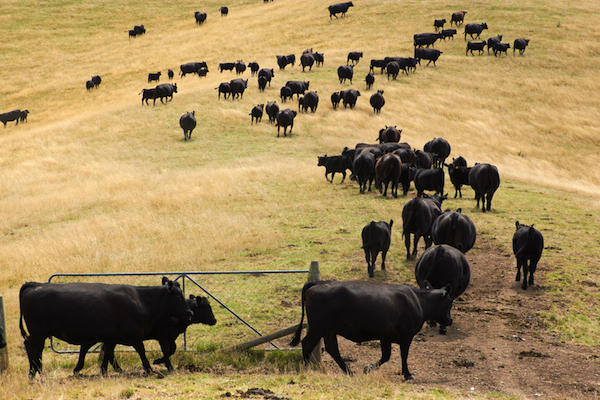 Medium steers across the east coast were the only category to sustain a price gain, up 4.6% to 264.6¢/kg live weight. In offshore markets, the 90CL frozen cow indicator remains reasonably steady at 572.8¢/kg CIF. Higher domestic US beef volumes offset by lower NZ and Australian imported beef levels have seen prices trek sideways. It’s getting tiresome sitting in the office looking at the next week’s rainfall forecast and seeing the same old picture of meagre offerings around the coastal fringes of Victoria and WA. I can’t imagine the despair on farms further inland, particularly in NSW. With little rainfall on the horizon, it seems consolidation to a weaker bias is the order of the day for cattle prices into next week.